​For more about Money, "1889 Money Then Etowah"
James Leander "Lee" Gash with wagon he used to deliver mail. His wife Julia stands on the wrap-around porch of the Gash home that once stood on Old Hwy 64. 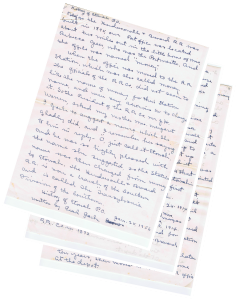 While brothers Ozark and Hugh Greer are appointed postmaster for Money in 1892 and 1894 respectively, author Lenoir Ray also writes that according to a family descendant, it was their mother Rebecca who took care of the mail. Family descendants also state that Rebecca Brittain Greer kept the mail in the solid cherry chest shown below. Mail was stored under lock and key in the top two drawers. The historic chest has been restored in recent times. Left, Rebecca Brittain Greer who acted on behalf of her appointed postmaster sons, Ozark and Hugh. General location of Money Post Office where the the Greer home and store once stood, circa 1893. 9th west hole, Etowah Valley Golf & Resort. L to R, Janice Greer Sumner and Jean Wells Huggins. A later photo of Annie Belle Bird Orr Robertson and her six children appears in PHOTO GALLERY.
" CARRIERS are not required to get out of their rigs to make delivery of any ordinary mail. " " Roads must be kept passable. Roads are not considered passable where any consideable portion of them cannot be traversed faster than a walk. " A First Class letter was 2 cents per ounce. Postal cards one cent each. The Historic Etowah Train Depot & Post Office once stood at the corner of Old Hwy 64 & Etowah School Road. 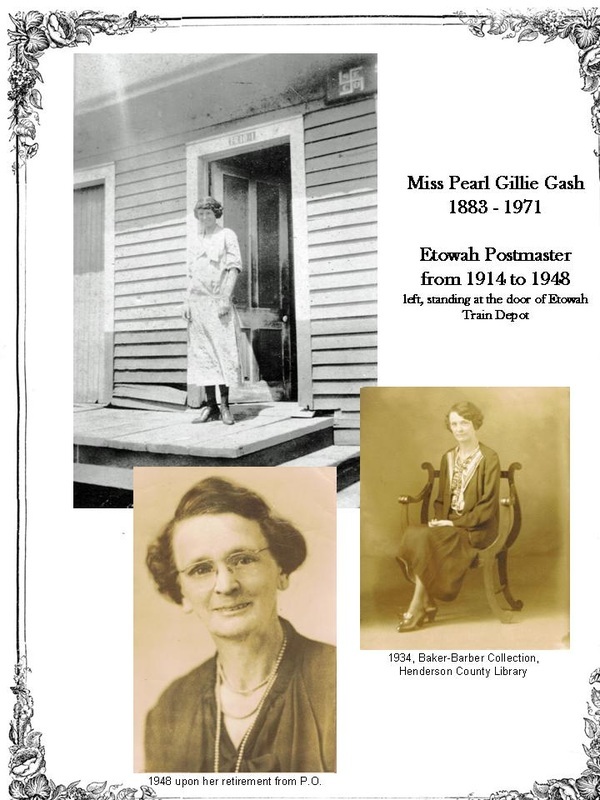 Pearl Gillie Gash, appointed Postmaster in 1914, is standing in the open door. Photo courtesy of Gash Family.
" Before the Hendersonville & Brevard R.R. was built in 1895, our Post Office was located about two miles out in the little home of Mrs. Rebecca Greer, who was the Postmaster. And the office was named "Money." When the office was moved to the R.R. Station, which was also called Money. The officials of the R.R.Co. did not seem to like the name of Money for their station name, and were very anxious to change it. So the President of the R.R.Co. Mr. J. H. Warren, asked my mother Mrs. Margaret I. Gash to suggest a name which she gladly did, and I remember her saying to him in reply - "O, just call it Etowah." And he was so highly pleased with the name she suggested, so the station name was then changed from Money to Etowah. The Hendersonville & Brevard R.R is now a branch of the Southern and is called the "Transylvania Division of the Southern." My mother's birthplace was Adairsville, GA and she suggested the name Etowah, because she thought it such a beautiful name and was the name of a very pretty river near her Adairsville home. Etowah is an Indian name, meaning High Tower. When everything was ready to move the P.O. to the R.R. Station, Mr. Joshua Laughter - now deceased - operated a small store, was to be the new Postmaster and he and my brother Lee Gash went up to the little office - Money - and loaded it up on a two horse wagon and moved it down to the little store, and in a short time the name was changed to Etowah. Mr. Laughter was appointed the first P.M. after it was moved to Etowah. I was appointed P.M. here April 24, 1914 and retired Dec. 31, 1948. Succeeding Mrs. Annie Orr. I was succeeded by Mrs. Addie Morgan - present P.M. I took charge of the office May 5, 1914. My father and mother donated the land for the Station to the Hendersonville & Brevard R.R. Co. in 1895. My first M.O. [money order] issued on the 6, day of May 1914 was #4770, and my last M.O. issued on Dec. 31, 1948 was #36,145. 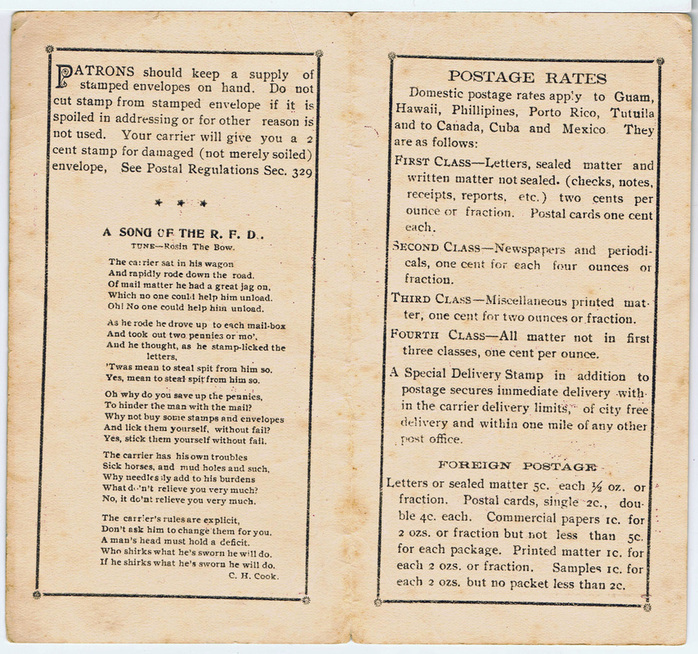 I am the Postmaster who pre cancelled the stamps for you sometime in 1930s. As to the pre cancellor I believe it only cancels one stamp, however I am not quite sure. I am also the only Postmaster who has had any occasion to use a pre cancellor here. My father Joseph Leander Gash was never Postmaster here, but was appointed P.M. in Adairsville, GA Oct, 18, 1865. But he was the first Station Agent appointed when the H & B R.R. [Hendersonville & Brevard] was built in 1895. He served 20 years until his death and on June, 1st, 1916, I succeeded him as Agent, and served until Aug. 23, 1948, when the station was made a non agency station. Then I retired from the R.R. and later the P.O. I kept the P.O. in my home ten years, then moved it to the R.R. office at the depot. " 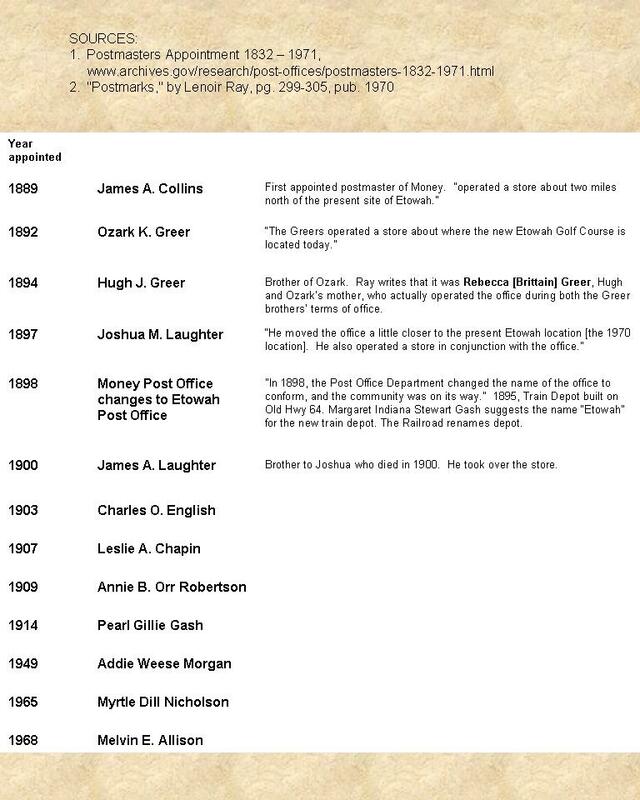 " Some other Postmasters were James A. Laughter, Byron Reeves, L. A. Chapin & C. O. English and Mrs. Annie Orr, who was succeeded by Miss Pearl Gash..." She [Pearl] was succeeded by Mrs. Addie Morgan, the present Postmaster. The office was then moved from the depot to the present site, a building owned by J. R. Morgan. " Excerpt from Pearl Gash's "History of the Etowah P. O." - "I kept the P.O. in my home ten years, then moved it to the R.R. office at the depot." This picture shows the "post office corner" of the Gash home on Old 64. Appointment of Pearl G. Gash to "temporary commission" as Postmaster at Etowah, dated April 24, 1914. At this time, there is no explanation for the status, "temporary." 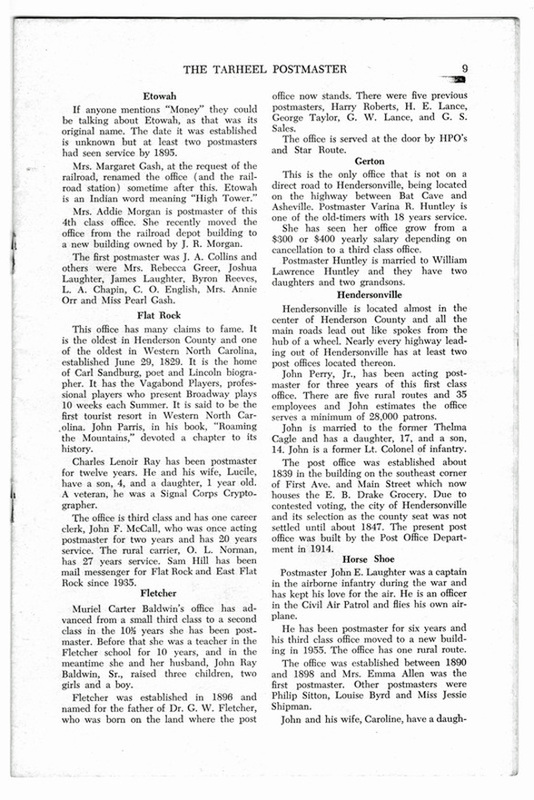 Pearl served as Postmaster until 1948.
a monthly newspaper for the association of North Carolina postmasters, begins with a brief history of Etowah postmasters. Another confirmation of the true story of how Etowah got its name. At the time of publication, Mrs. Addie Morgan served as postmaster and had recently "moved the office from the railroad depot building to a new building owned by J. R. Morgan.